So, you’re an experienced cannabis smoker looking to take the next step in your committed relationship to weed. Pre-rolled joints, eighths, and flower are old news to you. Of course, you don’t want to look like a fool at the next stoner social gathering, but you want to impress your friends with your ganja know-how. Luckily, you’ve come to the right place! The friendly budtenders here at Greenside Recreational have put together a quick information set to guide you on your newest endeavor: Edibles. Dosing: A general first-time dose can be anywhere from 2.5mg to 10mg depending on the size of the person consuming. A standard dose for an experienced consumer can range anywhere from 10, to 30, to even 50mg for someone with an extremely high tolerance. We recommend starting with 5 or 10mg doses, and one at a time. Onset: Edibles don’t affect you immediately, the way inhalation does. This is the reason why budtenders will tell you to start slow in your consumption methods. You can always eat another after you’ve waited enough time for the effects to kick in. Every body is different, but the extremely cautious measure of time is three hours to start feeling the effects. Allow us to repeat: You can always get more high. You cannot, however, get un-high if you’ve eaten too many edibles, so the best bet is to tread lightly until you’ve become more experienced. Effects: You will feel very relaxed, with a pronounced body high. Edibles have been known to produce mild hallucinatory effects, but only when consumed in very high doses. The effects of edibles are pretty similar to that of smoked cannabis, and yes — THC consumed orally will show up on a drug test, just like when smoked. 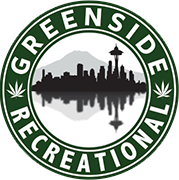 Now that you’re armed with all of your intel, get on down to Greenside Recreational and allow our budtenders to help you find the right edibles for your next adventure. Bon Appétit!